All great offenses have some element of misdirection. 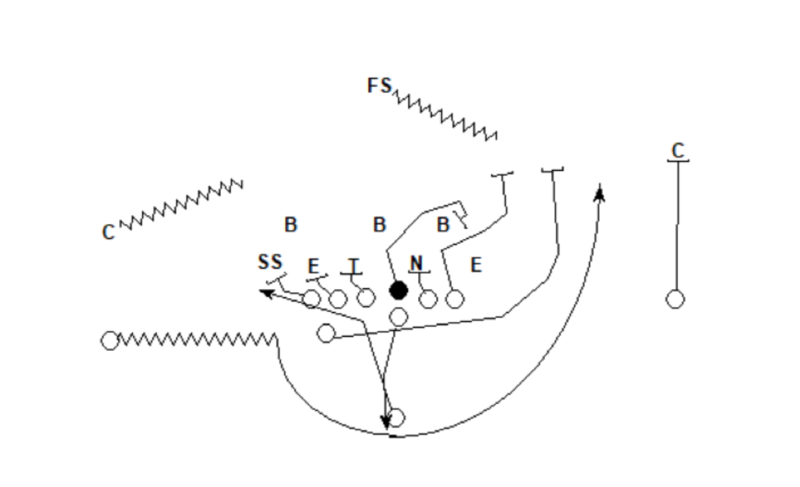 New Mexico’s offense created misdirection with the triple option. While there are many advantages to that style of offense, there are other ways in which teams without running quarterbacks can create misdirection in the running game. One of those ways is with the split zone end around series. Teams without a runner at the quarterback position can utilize this series to create misdirection in the running game while still maintaining an effective passing game, something option teams struggle to do because of the skill set of their players. The QB will fake the inside zone handoff to the running back and then hand the ball to the receiver on the end around. 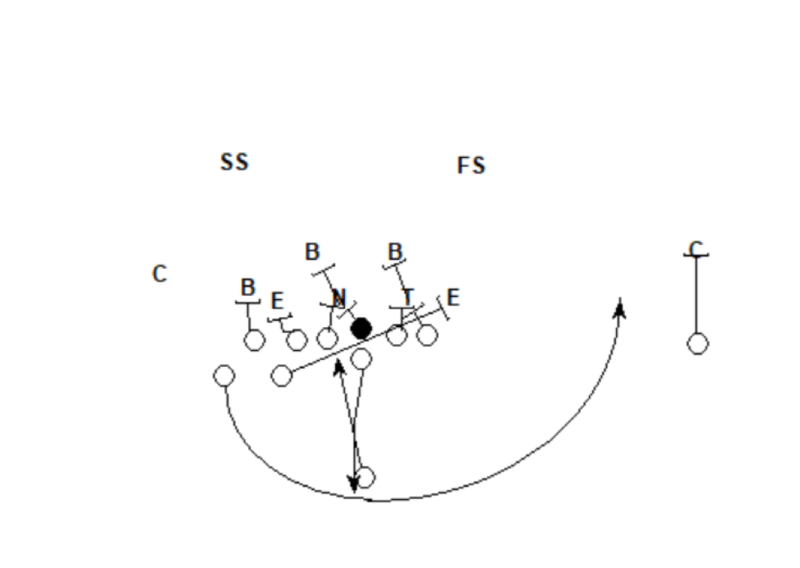 The fullback will come across the formation as if he was going to kick out the backside end before wrapping around him to the second level to block the first defender that shows outside of the end. The free safety flies down towards the box so the fullback kicks him out on his wrap block. The backside tackle and center are both uncovered so they peel back to block for the end around after climbing to the second level. There is no one in position to run down the receiver on the end around so the center keeps working up the field to block for the end around. However, with everyone except for the free safety sucked in by the inside zone fake, the backside tackle and center don’t even have to block anyone for the receiver to go untouched on the long touchdown run. 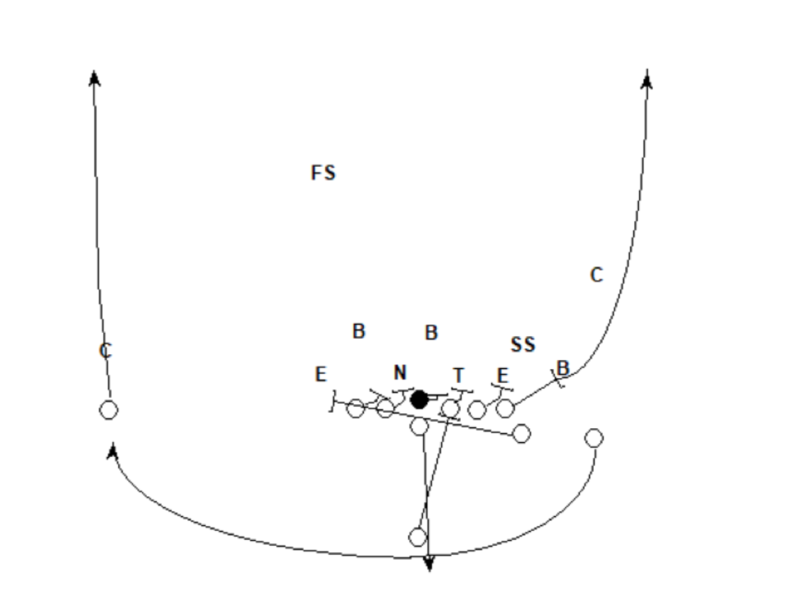 The fake end around action here has a similar effect to New Mexico’s split zone with triple option presentation. 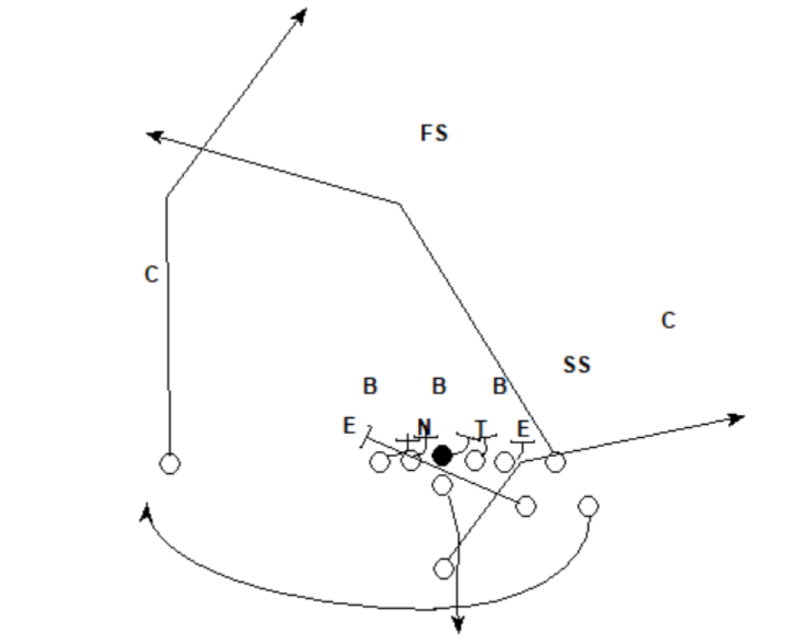 The action helps keep the backside end wide to give the fullback an easy kick out block. 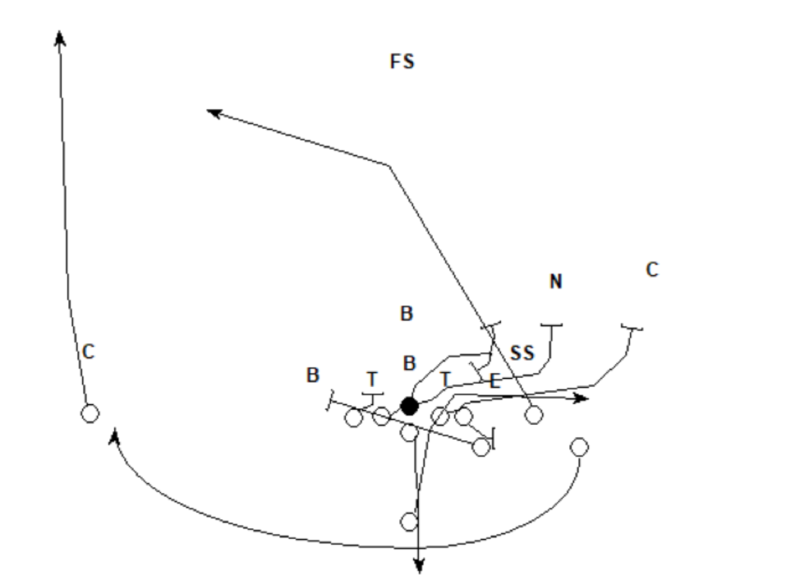 This action also removes the backside linebacker and backside safety creating a big cutback lane for the running back inside the fullback’s kick out. This concept is particularly effective off of this action because the fake end arond pulls defenders towards the flat, which opens up space for the deep cross working behind this area. 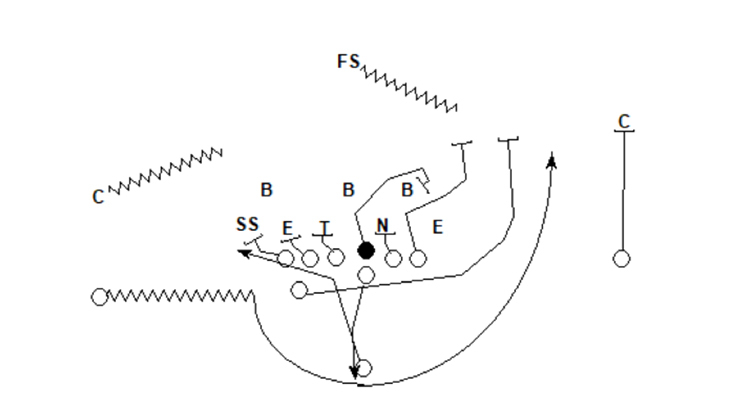 The deep cross takes one defender in man coverage across the field with him. Both the backside outside and inside linebacker start to get a lot of depth getting under the deep cross as they see the play-action pass start to develop. Three interior defenders are in a clear position to hit the quarterback but are held away by the fake end around. This leaves the offense with a ton of space for the running back and his three blockers on the screen play. Want more schemes? Create a free trial of Coaching OnDemand and access tons of materials from some of the brightest coaching minds.